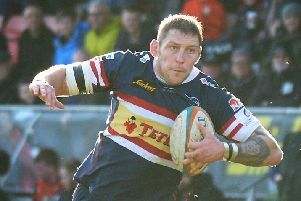 Doncaster Knights Glen Kenworthy. Picture Tony Johnson. Doncaster Knights ended the first phase of the 2018-19 Championship campaign on a high when beating London Scottish 36-20 at the Athletic Ground to claim their first win since mid-September. “It was a good win and one we felt had been coming for the last couple of weeks due to improved performances,” said head coach Glen Kenworthy. “The boys played really well and we are more than happy with the result. They’ve gutsed it out through the hard times and they put a performance in on Saturday for which they can all feel proud. “There had been a bit of a buzz in the camp all week and we set off well and caused them problems only to fall behind to an early interception try when we were in a position to score ourselves. “But we hit back and scored four very good tries and we felt we were good value for our 24-15 interval lead, not least as we had contributed in part to all three of their tries. “We knew that Scottish had scored a lot of their points this season in the second half of games and we told the players at half-time not to stop trying to play. “Unfortunately, we were guilty of doing just that during the third quarter as well as letting some ill-discipline creep into our game and they got back to within four points of us. “I wasn’t worried at that stage - just frustrated. But we won the game with two great tries by Curtis Wilson in the final quarter to which saw him complete his hat-trick. Several other backs, including full-back Cameron Cowell, also caught Kenworthy’s eye as did fly-half Kurt Morath. “He missed pre-season, which maybe showed in some earlier games, but he’s starting to raise his game,” he said. The squad were due to train today prior to having the rest of the week off with the club having no game this weekend.